I was thwarted yesterday. First the buses were badly timed/already buggified, so we ended up not going out to the farmer’s market, where I’d intended to get lemon curd from the award-winning lady who makes it. But we went downtown instead. Rats. But then! I got to go out to the market later! Hoorah! But! I had lemons. So today I made lemon curd. Ooh! Hey! It set up! Look! Lemon curd! YUM!!!!!! (I love lemon curd.) And it looks beautious. I first made lemon curd with Genista. And we made grapefruit marmalade at the same time. Both were awesome. 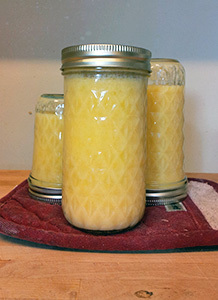 I have actually made lemon curd several times, here. Lemons are one of the easier produce items to acquire, and I can sometimes get fancy, schmancy, organic Meyer lemons (though, really, after experimenting, I think the extra sweetness of the Meyers are unnecessary). I've googled for recipes, and it's odd how varied they are, but the one I keep coming back to is the one from my Bryn Seion cookbook. Double boiler - melt butter, sugar, add in lemon juice and zest. Stir and cook until thick. I'm still easily amused by US recipes - just how much butter is a stick? If I'd been thinking about it, I'd have translated. To be fair, the recipes in this book are just the collected recipes of a church group that someone helpfully typed up. Most, I think, give more useful quantity labels. Except for the whole dry measure by volume vs mass thing, but until someone gives me a decent kitchen scale, I'll stick with volume. Awesome. I shall try this one next time. <3! For the record, lemon curd freezes beautifully! Oh does it? That's good to know. This should be fine, having been canned, but next time if I make three cups of it maybe I'll stick some in a tupperware container and freeze it. Thanks! Lemon curd in oatmeal! I had not thought of that. What an interesting idea. Are these steel-cut oats or does it matter? I should give it a try. It's delicious. And I just use regular (non-quick-cooking) oats. A bit of nutmeg and cinnamon, brown sugar if the curd is SUPER TART, a big dollop of curd. Berries if you got 'em. Om nom nom. I thought of it the other day because I was having berry coulis on my oatmeal and I thought "what this really needs is a dollop of lemon curd," and I was right. Or possibly Ted suggested it and he was right, but yes. Om nom nom! Yes, but see, I'm not impressed with my recipe, so I need yours! It is low-fat and low-calorie and OMGOMGOMG NOM! Also works with limes or key limes (the latter is IZ DED OMG NOM). Never mind putting it on anything, just eat it with a spoon. The recipe originally came with one for low-fat cheesecake, to be swirled into the batter and baked. People come hundreds of miles to eat that cheesecake. There's a link to it on the recipe page.